Myrtle Beach Jet Skiing For The Newbie! Action Water Sportz | Jet Ski Rentals Myrtle Beach > Jet Skis > Myrtle Beach Jet Skiing For The Newbie! There is a variety of water activities in Myrtle Beach such as jet skiing, deep sea fishing, and dolphin watching. 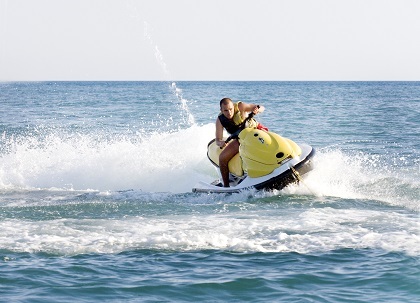 Jet skiing is one of one of the most exhilarating and popular activities that you could ever take part in, whenever you see the waterway or ocean. If you are planning to join this sport for the first time, you may be going through stressful times due to anxiety as well as unpredictability. You may not know how to start riding the ski, ways to enhance your speed, the best ways to stay safe in water and more. However, there is no need to panic since you are about to find out more regarding Myrtle Beach Jet Skiing for beginners. Before you set off on your jet ski, you will need to ensure that the engine shut-off clip is attached to your waistline. By so doing, it ensures that the engine is switched off instantly if you lose balance and also fall in the water. Though the chances of falling are very low, you should always be planned for anything that might come your way as you familiarize yourself with this equipment. Your guide at Action Water Sportz will make sure that the clip is attached properly and instruct you on what to do should you find yourself in the water. The life jacket is among one of the most important accessories for anyone associated with water sporting activities. Also one of the most seasoned and professional swimmers usually wear these jackets simply to ensure they are safe anytime they take part in jet ski water sports. Also, guarantee that the life vest is secured appropriately and firmly before you even start the engine. Your hands need to be positioned securely on the handles of the machine as you prepare to cover your very first distance. At this phase, you ought to engage the throttle when you are still near the coast, preserve your rate at the slowest degree which should be around 10 miles per hour. Making a turn is one of the greatest obstacles for most novices and if you find it hard at the initial stage, you should never ever be discouraged because it is typical. The best point to do is to practice the turns while still keeping the lowest rate possible. This procedure must be repeated several times up until you have the ability to balance and take fast turns. As a precaution, the turns ought to be practiced near the shore to avoid running into other boats and jet skiers. Keep in mind, that you will always have an experienced guide with you when renting a Jet Ski in Myrtle Beach from Action Water Sportz. They are there to make sure you understand the process so don’t be afraid to ask questions. The only way you will be able to practice your speed is by moving away from the coast. As you increase the rate of the Jet Ski, its nose will rise somewhat above the water level. This notes the start of fun and journey as you ride via the waves with some water sprinkling into your face. The speed that you are traveling will affect the lift of the craft and the Jet Ski could drift airborne for a couple of seconds. When this occurs, you just need to raise yourself some inches over your seat to reduce the degree of impact when the machine settles back on the water surface area. This is what makes jet skiing so satisfying and adventurous to the majority of people who like participating in water sports. Get to know more about jet ski riding and safety when you visit Action Water Sportz in Myrtle Beach.